Reagent exhibits at least 90% transfection efficiency of siRNA delivery. Transfection efficiency was determined by real-time RT-PCR. The 293 cell line was established from embryonic and tumorigenic kidney cells of a human fetus. This cell line expresses vitronectin receptors composed of the integrin beta-1 subunit as well as the vitronectin receptor alpha-v subunit and could be useful for testing efficacy of virucide. This cell line also makes an excellent transfection host. The 293 cell line is a hypotriploid human cell line that exhibits epithelial morphology. The modal chromosome number of 64 occurs nearly in 30% of cells. 293 cells contain Adenovirus 5 DNA on the left end sequence of the viral genome. All other 293 types of cell lines are derivatives of this parent cell line. All of the daughter cells exhibit similar characteristics. The 293 cell line was derived from cancerous fetal kidney tissue and is a reliable host for transfection studies carried out for cancer research. 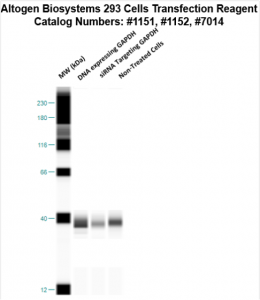 Altogen Biosystems provides transfection kits with low cytotoxicity for the 293 cell line. Figure 1. GAPD mRNA levels were quantified using real-time RT-PCR in the 293 cells transfected with siRNAs targeting GAPD or non-silencing siRNA. Forty-eight hours post-transfection, the cells were harvested and analyzed by real-time RT-PCR for GAPD mRNA expression levels. Data were normalized against the 18S rRNA signal. Control samples were either mock-transfected or untreated. Values are normalized to untreated sample. Data are means ± SD (n=5). Figure 2. Protein expression of GAPDH in 293 cells. DNA plasmid expressing GAPDH or siRNA targeting GAPDH were transfected into 293 cells following Altogen Biosystems transfection protocol. At 72 hours post-transfection the cells were analyzed by Western Blot for protein expression levels (normalized by total protein, 10 µg of total protein loaded per each well). Untreated cells used as a negative control. Altogen Biosystems is a life sciences company that manufactures over 100 cell type specific and preoptimized transfection kits, elecroporation buffers, and targeted in vivo delivery kits and reagents. Advanced formulation of reagents and optimized transfection protocols provide highly efficient intracellular delivery of biomolecules (proteins, DNA, mRNA, shRNA and siRNA, and small molecule compounds). Read more about transfection technology at Altogen’s Transfection Resource.